Ninety-eight months of RevPAR growth and counting. Breaking records is starting to sound like a broken record—every month a new all-time high RevPAR, every month another period of growth in this expansion cycle. From December 1991 to March 2001, RevPAR grew every month with one exception: a very slight decline in August 1998. So, technically speaking, we are now in the midst of the longest-running expansion cycle in the recorded history of the U.S. lodging industry. 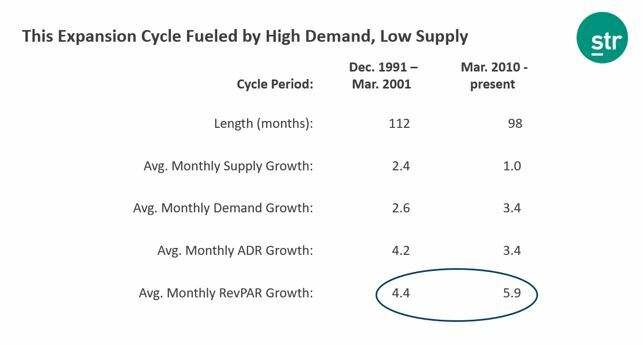 And here’s something interesting: In the 112-month expansion cycle of the ’90s, average monthly RevPAR growth was 4.2%. In the current 98-month cycle, it’s 5.9%. Considering inflation is substantially lower now than it was in the ’90s, this is impressive. You could argue the average growth is higher now since the crash of 2009 was so severe, but if you even exclude the exceptional growth of the 2010 and 2011 recovery years, the average RevPAR growth still stands at 5.3%. The substantial 4.2% RevPAR growth in April was driven predominantly by rate growth (+3.3%), though occupancy still gained ground to the tune of about a percentage point (+0.9%). The Easter comp didn’t seem to have a marked overall impact in either March or April this year, as occupancy movement was similar each month—up about a point—as was demand, which was up about three points for each month. There was evidence of the shift in the segmentation numbers, however, which I’ll get to below. Now that a third of the year is in the books, what do the overall numbers tell us? We’d heard as much in the recent spate of REIT and C-Corps earnings calls. Most public lodging companies met or exceeded their Q1 estimates, and many are adjusting their year-end RevPAR outlook by upwards of 150 basis points. The healthy economy is giving more confidence to transient travelers—both corporate and leisure—which is good news for hotels as we lean into the busy summer months. The industry hadn’t seen monthly average-daily-rate growth in excess of 3% since January 2017—until last month, when it reached 3.1%. And April’s 3.3% rate growth proves this wasn’t a fluke. Pricing power is coming alive with the strong demand growth. Of course, two months does not establish a clear trend, and we’ve seen rate growth flutter about in fits and starts before. But this is the fourth straight month of ever-increasing rate growth, which is promising. The hotel economy isn’t just “holding on,” it’s accelerating. Supply grows, but is truly only problematic in certain locales. Demand remains impressive, which bodes well for the busy summer months. Pricing power shows signs of life. Let’s see if it continues. Travelers should prepare to pay more at luxury and economy hotels—as those classes have shown the greatest rate gains this year. Hotels continue to show robust profitability, despite labor cost woes. Don’t forget the hotel economy is predicated on the broader economy. We’ll be keeping an eye on interest rates, inflation and gas prices. Any financial projections or returns shown on the website are illustrative examples only, and there can be no assurance that any valuations provided are accurate or in agreement with market or industry valuations. Any investment information contained herein has been secured from sources Hotel Innvestor believes are reliable, but we make no representations or warranties as to the accuracy of such information and accept no liability therefor. Offers to sell, or the solicitations of offers to buy, any security can only be made through official offering documents that contain important information about risks, fees and expenses. Investors should conduct their own due diligence, not rely on the financial assumptions or estimates displayed on this website, and are encouraged to consult with a financial advisor, attorney, accountant, and any other professional that can help you to understand and assess the risks associated with any investment opportunity. Articles or information from third-party sources outside of this domain may discuss HotelInnvestor or relate to information contained herein, but HotelInnvestor does not approve and is not responsible for such content. Hyperlinks to third-party sites, or reproduction of third-party content, do not constitute an approval or endorsement by HotelInnvestor or NCPS of the linked or reproduced content.